The island of Delos is a must for history buffs and lovers of Greek mythology. In fact, the UNESCO World Heritage site one of Greece's most important mythological, historical and archaeological locations. People have lived on Delos since the 3rd millennium BC, with the island serving as a sacred site for multiple religions, cults and sects over the centuries. It has also played a role in numerous historical events and been the subject of myths and prophecies. Archaeological excavations on Delos are extensive and ongoing, uncovering many valuable buildings and artefacts. 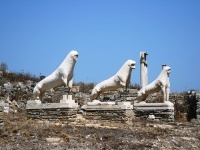 Some of these are on display in the Archaeological Museum of Delos. Visitors should look out for the circular Sacred Lake, the Minoan Fountain, the Terrace of the Lions, and several impressive ancient buildings and temples. Travellers visiting Mykonos should definitely include a trip to Delos in their plans.